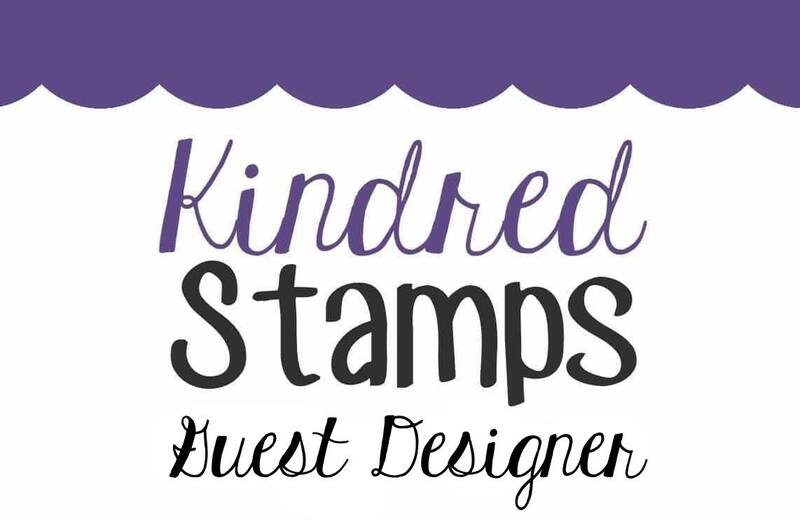 Nicole was our hostess on the Stampin'B's DT Blog this week. 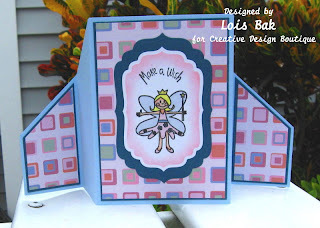 Her challenge was to make a baby card in colors other than pink or blue. In addition, it had to be a square card. I like doing baby cards in colors other than pink or blue because you can do them ahead of time, without worrying about what the baby will be. Nicole’s challenge gave us that opportunity. I used a piece of DP from a pack called Victoria Mini Papers from Jenni Bowlin and went with the yellow and green in the paper. As part of Nicole’s challenge was to make a square card, I didn’t even have to trim the DP -- it was already 4 inches by 4 inches. 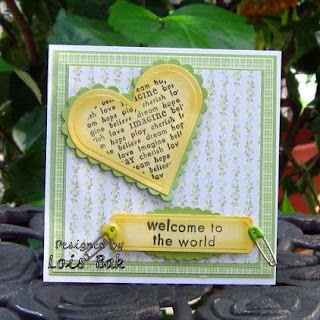 I stamped a heart-shaped sentiment from a set of Fiskars baby stamps and cut it out using my Nestabilities heart dies. I used Barely Banana and then sponged it with So Saffron to make the edges a little deeper shade of yellow than the center behind the sentiment. I had some safety pin-shaped brads, which I attached to the Double-ended tags, also from Spellbinders, for the lower sentiment. The green plaid DP is from a DCWV pad called Nana’s Nursery. The matting and scalloped pieces are cut from Certainly Celery, and the card base is white. 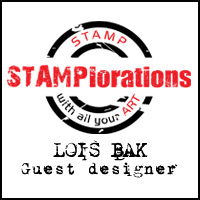 To see the rest of the team's creations, check out the Stampin'B's Blog. I was visiting my sister this weekend, and we decided to play a little bit with my new Big Shot accessories. She also has a Big Shot, so I didn’t have to cart that along with me on my drive to Southwest Florida. The cards were cut out with the Sizzix Movers and Shapers die, one with a three-hole insert and the other with a one-hole insert. 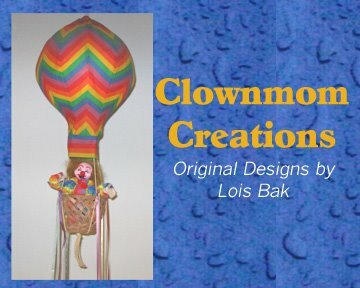 I “borrowed” the idea for the witch card from my friend, Rosemary. 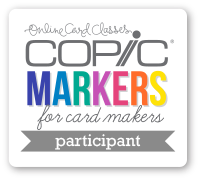 After sponging a big circle lightly with More Mustard ink on the upper right-hand corner of a 4-inch by 4-inch piece of white cs, I punched a circle template with a 1 ¾ inch circle punch. I then sponged inside the circle more firmly – forming the moon. I sponged the rest of the square with Not Quite Navy. The fancy witch is from an Inkadinkadoo Halloween set I bought last year. She is stamped with Versafine Black Onyx, as is the sentiment. The three spiders, from PTI’s Spooky Sweets set were stamped through the small holes onto the inside white piece. The scarecrow on the other card is from a brand-new Debbie Mumm autumn set, as is the pumpkin on the inside. Both are stamped with Palette Noir Black and then colored with Prismacolor and Copic markers. The DP behind the scarecrow is from a Debbie Mumm DP pad called Harvest and Holiday. 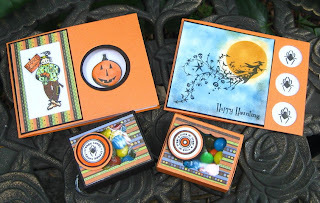 The two candy containers were made from the Sizzix Matchbook XL die from Stampin’ Up. After punching out the centers with SU's curly label punch, I glued some acetate over the openings and put the circle sentiments, both from PTI’s Spooky Sweets set, to one side of the hole so you can see the candy inside. 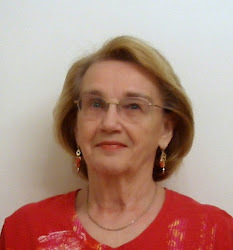 Vicky Gould was the hostess of the Stampin'B's DT Challenge this week. Her challenge was to make a tall card, with no stamping. We could use any kind of die cut or whatever that we liked. I found this challenge quite interesting. 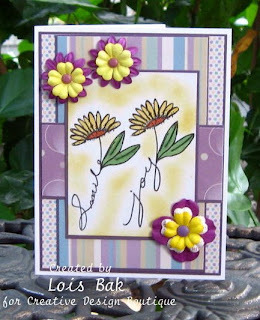 I recently received a set of Spellbinders Daisy Head dies from a friend and decided they would work well on a tall card. After cutting them out, I used a sponge dauber and Pumpkin Pie ink to highlight the embossed portions of the flowers. Because the card is tall, I was able to use my Long Rectangular nesties to cut the panel behind the flowers and Sizzix leaves, which were cut from Always Artichoke cs. I sponged the background of the vanilla panel using a sea sponge and Always Artichoke ink. I like the way the sea sponge looks -- with a varigated pattern. The sentiment on the oval panel was cut with a Cuttlebug Olivia alphabet die from the same DCWV DP as the border down the side, which is punched with a Martha Stewart lacey border punch. 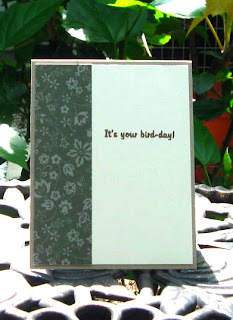 You can see all the cards for this Stampin'B's challenge here. 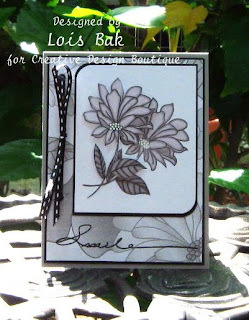 I did a couple of SCS challenges in the past few days -- the Inspiration Challenge and the Featured Stamper Challenge. I wound up using a butterfly for both. Saturday's inspiration website was so full of wonderful stuff. I chose this -- http://www.tracyporter.com/Katsina-R...r-p-17534.html -- because I thought the design on it looked like a butterfly and I loved the colors. I stamped two images of my favorite butterfly stamp, SU's retired Stipple Butterfly, and colored it with Prismacolor and Copic markers. I cut one image out with a Nestabilities die. After going over the second butterfly with a Stardust gel pen to give it a little shimmer, I cut it out totally and popped it up on the first one. It's hard to see on the photo, but I stippled the white circle with River Rock. Today's Featured Stamper was another unknown to me. 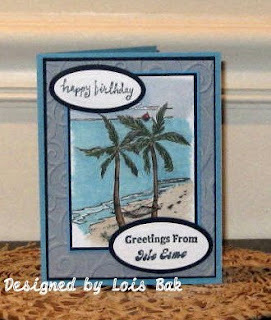 As I was wandering through Diane's gallery I found this card -- http://www.splitcoaststampers.com/ga...p;ppuser=70774 -- that caught my eye. 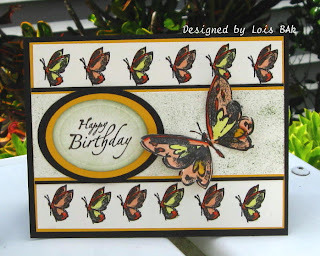 I loved all the butterflies on her card, so I kept them all, as well as the layout. 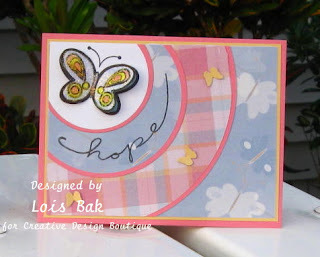 What I changed was: different stamp for the large butterfly; smaller stamps instead of DP for the border; different shape for the sentiment; and eliminated the flourish. 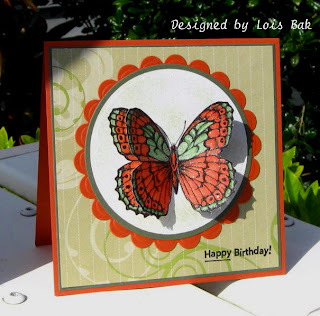 I love butterflies, so for my stint as hostess of the Stampin'B's Design Team Blog challenge this week, that's just what I challenged the team to do -- put a butterfly on your card. I was looking for a different layout when I came across a website called Page Maps and found a sketch on the June page http://pagemaps.com/jun09cardmaps.htm that looked interesting. I cut the smaller circles from both designer paper and Pretty in Pink cs with my Nestabilities dies, but the largest one was bigger than the largest die in the set; so I used a Fiskars circle template and a craft knife. I stamped the butterfly from the Rita Marie's Make a Wish set twice, coloring both with Prismacolor and Copic markers. I patted one of them with a Versamark pad and sprinkled it with halographic embossing powder so that it glitters. After gluing all the circles down on a piece of So Saffron cs, I stamped the greeting from the Rita Marie's Words to Live By set. One thing I like about clear stamp sentiments is that you can bend them to different shapes -- in this case, circular. I cut out the second butterfly and mounted it with a couple of glue dots and bent up the wings. I added a few punched out butterflies for accent. I didn't get to play Wednesday's Sketch Challenge, so I combined it with Thursday's Ways to Use It challenge (Seeing Double). I made two stemmed daisies using Rita Marie and Company's Words to Live By. The daisies are colored using Prismacolor and Copic markers, with a "glow" created by sponging some So Saffron around them. I added a few primas for some depth. My card for SCS's Featured Stamper challenge this week is a birthday card for my daughter, a BIG Twilight fan, much like her mother! Those of you who have read Twilight will understand the scene. 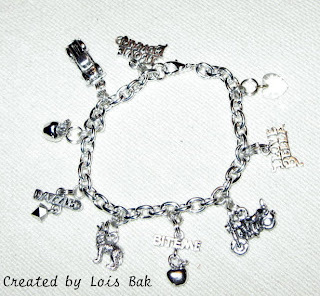 I also made the gift I'm giving my daughter - a charm bracelet, using charm I found on the Artful Inkables site when I was looking at the Twilight-inspired stamps. I have a friend who is much more talented in the jewelry-making department, but I think Kathi will enjoy this bracelet. It has eight charms, all Twilight-related. Another day with two challenge cards -- one from today, one from last Tuesday. 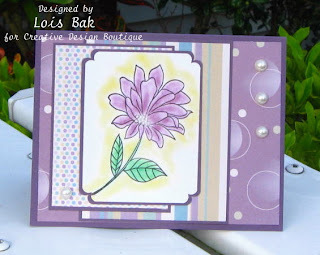 My first card is my entry in this week's Stampin'B's Design Team Blog challenge. NancyRuth was our hostess, and her challenge was to use only neutrals -- white, grays, black, browns. 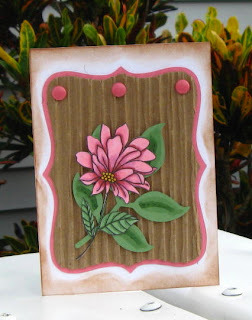 This week's Timeless Tuesday on the Flourishes Forum at Splitcoaststampers was to make a card in which you cut out part of the image and pop it up. The top leaf is popped up once, and the lemons are popped up twice. 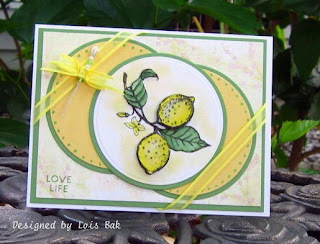 I'm not sure you can see it in the photo, but I embossed the lemons with clear embossing powder. The layout is exactly what I had in mind when I started, but I think I like the final version. After I laid out the two yellow circles, I cut out the overlay portion so that it wouldn't be so bulky. Labels: Creative Design Boutique, Flourishes, Rita Marie and Co. I'm new to the Twilight Tuesday challenges but decided to dive right in. I colored the truck with Prismacolor pencils and Gamsol and then cut the panel into three sections, matting them in Real Red. In keeping with the Twilight colors, I used some Basic Gray DSP for the background. I stamped the sentiment in a punched square for the piece at the top right. I was able to do two SCS challenges in a row this week -- the Color Challenge and the Sketch Challenge. I decided to pull out my long-neglected chalks for the Sketch Challenge, and what a delightful sketch it is. Using various DPs from Rita Marie and Company for the backgrounds, I enlarged the main panel to accommodate the size of the violet image. My friend Faith was the guest hostess for the Color Challenge, one that I rarely do for some reason. I used a brand-new stamp from Whiff of Joy and colored her with Prismacolor and Copic markers in the color challenge colors -- Bashful Blue, Tempting Turquoise, Apricot Appeal, and Creamy Caramel. 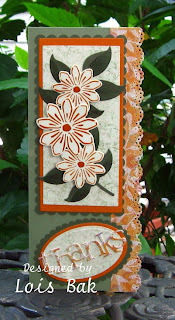 I sponged around the main panel with Apricot Appeal and used some Tempting Turquoise DSP and Apricot ribbon. 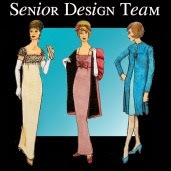 Stamps and Rita Marie DP can be found at Creative Design Boutique. Today's Technique Lovers Challenge was a Stand-Up card. It was a new fold to me, and I really enjoyed making these cards. 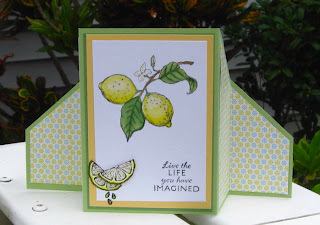 I used Flourishes new set Life, Love and Lemons on my first card. I added a couple of lemon slices down in the corner with some lemon drops. Actually the lemon slices were an after-thought. I had smudged some green ink on the card and needed to hide it. As I've heard my SU upline say, "There is no such thing as a mistake in stamping, just an opportunity to get creative." I put Crystal Effects on the lemon drops to make them stand out a bit. After looking through many of the categories, I settled on a Monet painting of waterlilies -- http://www.posters.com/pv-424702_Water-Lilies.html -- so that I could used my as-yet-uninked Waterlily set from Flourishes. 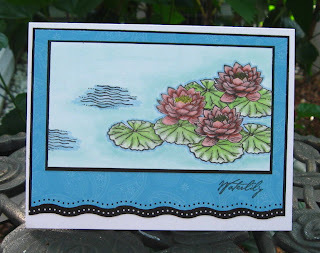 After much masking and stamping, I colored the waterlilies and lily pads with Copic and Prismacolor markers. To give the water a lighter feel, I used some Pebbles Pearlescent chalks in two shades of turquoise. I thought the EK Success border punch gave the feel of water. 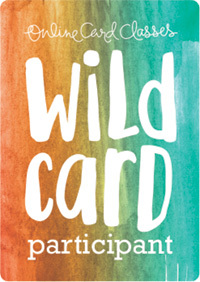 There was so much to look at on the website of today's Inspiration Challenge that I had to make a second card. Big Johnny Depp fan that I am, I chose this poster -- http://www.posters.com/pv-552761_Pir...n--Johnny.html I had bought this Rubber Stamp Avenue pirate stamp (which is NOT supposed to be Capt. 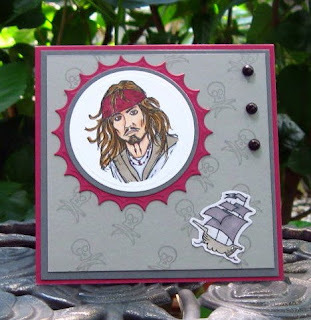 Jack Sparrow, but you'll never convince me of it) at a stamp show last year and have had a lot of fun with it. I colored it with Prismacolor and Copic markers and mounted it on several mats. The other two stamps are from a Changito Pirate set. Because Capt. Jack's ship is the Black Pearl, I colored the three MS pearls with Black Prismacolor marker. Faith’s challenge to use metal on our card this week set me to thinking. Rather than use the first thing that came into my head, which would have been hardware of some kind, I decided to take her literally. So I used a piece of gold-colored sheet metal I had left from a class I took about a year ago. 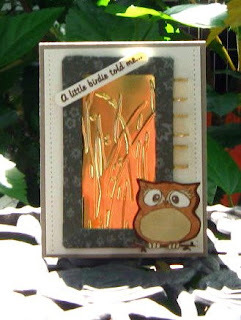 I ran the metal through my Cuttlebug, using the Bird Call embossing folder. After making a frame using a piece of chipboard, I covered it with Always Artichoke DSP and taped the gold piece behind it. I pierced down the sides of a piece of Very Vanilla and glued it to a Kraft card base. Olivia the Owl was stamped with Palette Burnt Umber ink and colored with Prismacolor and Copic Markers and then glued onto the front of the frame. A few pieces of ribbon and the sentiment cut with my Word Window Punch and I was finished. The sentiment was a little longer than the opening in the punch, so I cut it out fully and then fed it into the under side of the punch to cut each end. I included a photo of the inside where I used another piece of the Always Artichoke DPS and stamped the end of the sentiment. 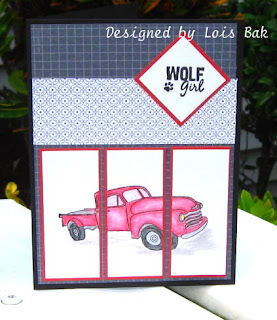 Images may be seen at Sweet 'n Sassy Stamps. Melody was subbing in the Way To Use It Challenge on SCS today. She sure picked a "challenging" challenge for us -- to use corregated cardboard on our creation. She did give us a hint on how to remove one side of the cardboard. If you spray it with water and let it sit for a minute or two, it will peel right off. Guess what -- it worked! After peeling off the one side of the corregated cardboard, I cut the Top Note shape, cutting off outside the dotted line. I mounted it on a piece of Regal Rose cs also cut with the Top Note die. The flower is from Rita Marie & Company's set Violet Garden, colored with Copic and Prismacolor markers. I cut out the violet and backed it with a Sizzix leaf diecut, accented with some Copics; then glued them both to the cardboard. I wanted to dress it up a little, so I added the brads at the top. I sponged around the white card base with Creamy Caramel. 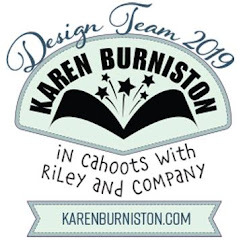 Today is the first day of my stint as a member of the Design Team for Creative Design Boutique. 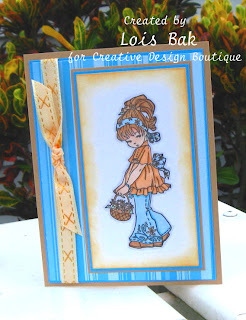 I used SCS's Sketch Challenge 235 for this card. 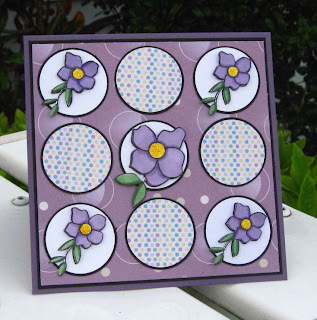 * Stamps - Violet Garden by Rita Marie and Co.
* Paper - SU Perfect Plum and Basic Black, GP White, Micro Dots Jubilee DP and Circle of Love DP from Rita Marie and Co.
Labels: Creative Design Boutique, Rita Marie and Co.